Onshore development similar to that proposed in DA260/15. o The three arms of the proposed marina would be in similar locations to DA260/15, but have different lengths (some longer), and with a different mix of vessel sizes. Given the absence of a firm proposal, it is not appropriate at this time to make firm statements about the proposal overall, except to note that the JRPP, in rejecting the previous DA 260/15, called for fewer and smaller boats covering less of the western arm of Berrys Bay whereas the foreshadowed design has more and larger boats covering more area. The SaveBerrysBay committee is therefore of the view that if the DA is submitted as foreshadowed, there will be valid opposition to it. Further, the following principles have been developed and given to RMS and others, outlining the constraints and opportunities for the Bay as we see them. Until the situation becomes clearer, the reader is encouraged to view the history below of the previous DA and why the public fought so hard to have it rejected. ancillary works and structures including roads, infrastructure, amenities, etc. We did not object in principle to a marina in Berrys Bay. 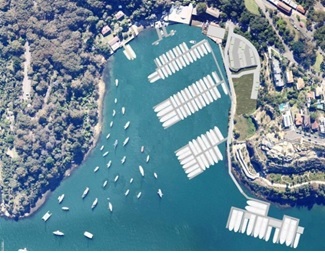 However, this proposal was an unacceptable over-development, tipping the balance way too far in favour of the private interests of the marina operator and big boat owners, at the expense of natural and heritage values of the bay and the public enjoyment of the bay by all the residents of Sydney and visitors. 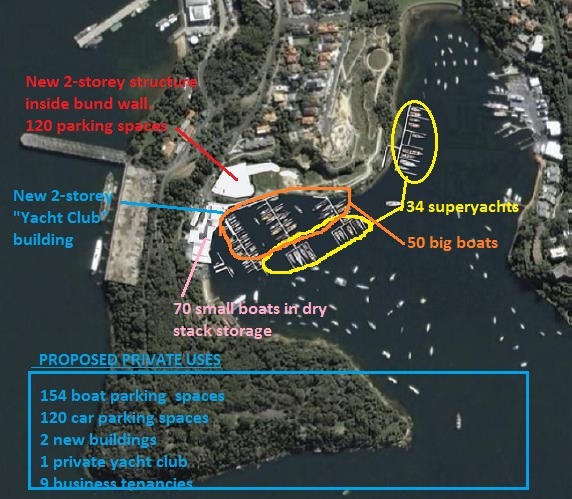 Berrys Bay – a parking lot for big boats? 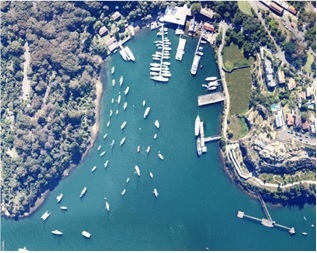 Berrys Bay is an icon within Sydney Harbour and must not be compromised. The beautiful reserve lands around the Bay have been gifted to the people of Sydney. The proposed development is inconsistent with the public use of these lands and would greatly diminish their public value. The proposal is incompatible with the objectives of the key legislation protecting the Harbour and its foreshores, the Sydney Regional Environmental Plan (Sydney Harbour Catchment) (2005). The need for a marina of this size has not been established. The marina is excessive in size and the impact of its three arms within the western part of the Bay is overwhelming and unacceptable. The proposed development of the Dolphin Wharf in the eastern part of the Bay for very large vessels is excessive, impractical and inconsistent with the adjoining Carradah Park. There are significant and degrading visual impacts that have not been addressed and cannot be addressed while the development is of such a scale. The heritage significance of the old Woodleys Boatshed, as seen from the water, is lost. The artistic heritage of Berrys Bay has not been considered at all. The social impacts of the proposal have not been adequately addressed, particularly consideration of the wide range of people impacted. The proposed marina parkland, as designed would be of limited public value. It should be placed in Council’s care, control and management and incorporated into Carradah Park. Pedestrian access from Balls Head Road to Carradah Park is inadequate, very compromised and potentially dangerous. The details of the on-land buildings raise more questions than they answer. In particular the “Yacht Club” is an undefined entity. Car parking should be contained within the bund wall, the roof of the parking structure landscaped and made publicly accessible as a viewing/ picnic area. Traffic implications will need to be given close consideration in the overall context of the Waverton Peninsula. We think they make a powerful case against the scale of the proposal. Do look at the photomontages of the visual impact at the conclusion of the Chesterman report.